Contrails ! Burn Baby Burn ! Contrails ! Burn, baby burn ! Stemme recently issued an urgent Service Bulletin indicating the possibility of fire with 100% propylene glycol coolant such as Evans NPG+ in the Rotax powered S10-VT aircraft. Many Rotax owners are getting concerned, so Europa Builders Ron Parigoris and Wayne Gutschow undertook an experiment to compare the flammability of different coolants and engine fluids, with most interesting results. Caution : do not try this at home ! 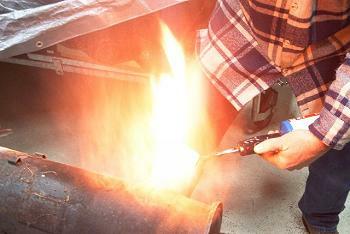 Heat supplied by a Propane/Air Heat shrink torch wide flame (reasonable BTUs for a small torch). If tank is inverted where you get liquid propane in the handle, it gets plenty cold. This compared to a standard hardware store torch that will only get slightly cold is indicative that torch used makes a lot more BTUs. Test 1 Flame ignition was using a thin aluminium weighing dish with flame severely heating contents and flame licking boiling sample and any vapors, thus igniting them. Flammability in descending order, 1 being most flammable. Test 2 BTU Output is perceived BTU output using calibrated "Eyechrometer" of Test 1. Test 3 Heat Ignition was heating the thin wall inlet pipe of a borrowed muffler from hangar next door (probably stainless), no flame hitting contents that drip on the hot pipe. I was able to heat to a visible red in my hangar that is pretty well lit. Looking in the Pocket Reference Book, steel heated to red that is visible in daylight is 975 degrees F (524 °C), so I will dart throw we were at ~1000 degrees F (538 °C). If I let it cool just a bit, it would not ignite anything. If you get sample close to Auto Ignition Temperature, a spark can very easily ignite (Fire Point). All samples in Test 1 Ignited fairly easily. I read a long time ago that the Auto Ignition Temperature of 100LL is higher than Aviation oil. Some folks have sent me documentation that I was wrong stating such a thing. I can now say for sure, that at approx. sea level, with ambient ~ 50 degrees F, that 100LL has a higher Auto Ignition Temperature than Mobil 1, 10W40 Cycle oil. I got temperature of Test 3, just cool enough so 100LL just smoked when I dripped it on the pipe, then took heat away, dripped Mobil 1 on it and it ignited, dripped 100LL on it and it just smoked, dripped Mobil on it and it ignited, dripped 100LL and it smoked, dripped Mobil 1 on it and it ignited again. I feel pretty confident that the same results will be achieved under the cowl; Mobil 1 will ignite well before 100LL. Oil burns slow, but lots of BTUs, 100LL much faster and large flame, less BTUs, Evans and Prestone less flame than 100LL and less BTUs. Evans or Prestone 100% ignited immediately in Test 3. Most samples in Test 3 if too much sample was poured on, it would roll off and extinguish before it hit the floor, especially Prestone 50/50. The samples being poured on were at approx 50 degrees F. In other words 50 degrees F was below their Fire Point. Evans in Test 1 was boiling violently when ignited, if I kept heat on to maintain boiling the flame was ferocious, the second the flame was taken away the boiling stopped and the flame tempered down. Evans does not ignite quite as easily as Isopropyl Alcohol, but I think it has a bit more BTUs. Isopropanol ignites on a hot exhaust muffler. When doing Test 1 with Mobil 1, when heat was removed the flame tempered down a bit but flame was far more persistent. Once Mobil 1 gets going, it is the hands down BTU winner. Prestone 100% ignites just a tad bit harder than Evans. BTUs are about the same. Prestone 50/50 took about 10 to 15 seconds of on and off adding heat (so as to not boil out dish) to get rid of water. Then it burned about same as Prestone 100%. When Test 3 was tried on Prestone 50/50 it would not ignite with the same quantity as other samples. Pouring a lot more sample there was plenty of steam, and then a little flame, but flame was short lived. There is only approx. 3.5 L coolant in a 914. That said, many gallons of 100LL are available, lots of gallons at once is bad, but a small leak that is persistent and has ignited is plenty dangerous, it can precipitate larger fuel leak, or oil or coolant leak. That said 100LL is a bit hard to ignite. Oil is pretty bad if it is hot, ignite it in a pinhole leak or in a 1 or 2 quart volume, it is thick, does not vaporize easily, and will do plenty of damage. Evans or Prestone 100%, 1 quart all at once on hot muffler or turbo, some will flame all at once, but much will boil off taking away plenty of heat, once below auto ignition temperature it will burn like Isopropyl Alcohol, not super violent, and vapors will be drawn out of cowl, and more will run out than with Mobil 1. My dart throw is all at once of Evans or Prestone 100% not super terrible, that said a pinhole leak shooting a consistent 1/16" stream on a hot exhaust part for a long time could very possible be worst. Prestone 50/50 has much less a risk of causing harm from a leak. Phase change of water to steam removes an awful lot of heat, ask any Firefighter. I will accept risk of Evans NPG+ coolant in a massive or pinhole leak; there isn't that much volume of coolant. If you have a raging inferno that burns through coolant lines, I don't think it matters much, Evans, or Prestone 100% or Prestone 50/50, they will all burn with plenty of heat and flame around. Ceramic, porcelain or exhaust component insulating wrap will for certain help to limit Auto Ignition temperature being achieved. The flash point of a flammable liquid is the lowest temperature at which it can form an ignitable mixture in air. 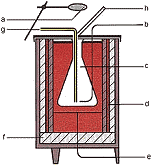 At this temperature the vapor may cease to burn when the source of ignition is removed. A slightly higher temperature, the fire point, is defined as the temperature at which the vapor continues to burn after being ignited. Neither of these parameters is related to the temperatures of the ignition source or of the burning liquid, which are much higher. The flash point is often used as one descriptive characteristic of liquid fuel, but it is also used to describe liquids that are not used intentionally as fuels. 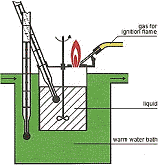 The auto-ignition temperature or kindling point of a substance is the lowest temperature at which a chemical will spontaneously ignite in a normal atmosphere without an external source of ignition, such as a flame or spark. This temperature is required to supply the activation energy needed for combustion. The temperature at which a chemical will detonate decreases as the pressure increases or oxygen concentration increases. It is usually applied to a combustible fuel mixture. Auto-ignition temperatures of liquid chemicals are typically measured using a 500 mL flask placed in a temperature controlled oven in accordance with the procedure described in ASTM E659. The commonly accepted autoignition temperature of paper, 451 °F (233 °C), is well known because of the popular novel Fahrenheit 451 by author Ray Bradbury (although the actual auto-ignition temperature depends on the type of pulp used in the paper's manufacture, chemical content, paper thickness, or a variety of other characteristics). where k = thermal conductivity (W/m·K), ρ = density (kg/m³), and c = specific heat capacity (J/kg·K) of the material of interest. is the temperature, in Kelvin, the material starts at (or the temperature of the bulk material), and q" is the heat flux (W/m²) incident to the material.